A pair of CSX EMDs leads a loaded rail train for the MBTA past what’s left of Beacon Park Yard on June 15, 2018. The yard was closed in August 2013. The original Boston & Worcester Railroad first laid rails in 1832, and by 1844 formed a link with Western Railroad over the Berkshire Mountains to a connection with New York State. By 1870, the associated lines were consolidated as Boston & Albany Railroad, which came under control of New York Central in 1900. Despite a general economic downturn in the postwar era, as late as the 1950s there were still more than 500 freight customers in the Boston terminal area, with Boston & Maine competing with B&A for a share of the traffic. The first incursions came in 1955, when the state proposed to extend the Massachusetts Turnpike from Newton into downtown Boston. Choosing the most direct route, the Turnpike Authority purchased the B&A right-of-way from milepost 8 to Back Bay. Four tracks were cut back to two, and construction began in 1962. By the time the extension was completed in 1965, the old Beacon Park Yard was surrounded by the new highway. New York Central converted the facility into an intermodal yard, bolstered by easy access to the highway and its location just outside the city in Cambridge. Despite tough grades over the Berkshires, B&A’s superior connections west of Albany to Chicago and St. Louis provided a lucrative competitive edge over B&M’s routing via Delaware & Hudson and Erie Lackawanna. B&A remained an important artery for New England traffic through the Penn Central and Conrail eras. In 1973, the Massachusetts Bay Transportation Authority acquired the line between Framingham and Boston to preserve the route for commuter service, though freight traffic remained uninterrupted. The power for CSX Train B721 is running light along the docks in the Coke Works in Everett, Mass., on April 29, 2018. By the 1980s, only a handful of rail-served customers remained in Boston. As the economy shifted, old industrial property was redeveloped into new commercial and residential projects. 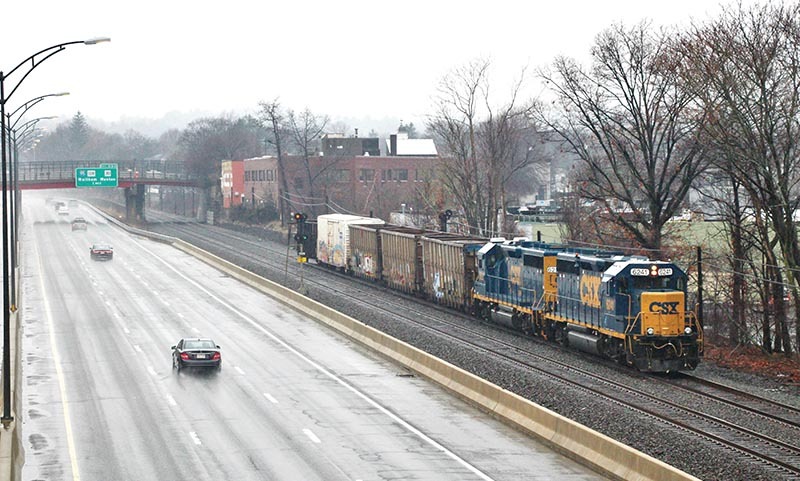 While Conrail embarked on clearance improvements to make way for increased intermodal double-stack container traffic, traditional freight traffic to the heart of the city had all but evaporated. 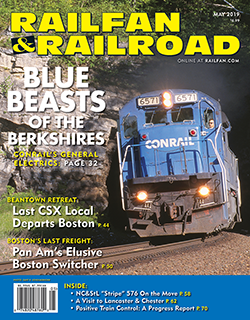 In September 2009, the Commonwealth of Massachusetts struck a deal with Conrail successor CSX Transportation to acquire the former Boston & Albany main line from Boston to Worcester, including the Grand Junction running track through Cambridge, and several other branch lines in southeastern Massachusetts. This agreement consolidated the holdings previously acquired by the Turnpike Authority in 1962 and the MBTA in 1973. In return, the Commonwealth would help fund the expansion of the Worcester Intermodal Terminal and the “Transflo” transload facility at Westborough, as well as track capacity projects on B&A to enable increased double-stack intermodal service to Worcester. 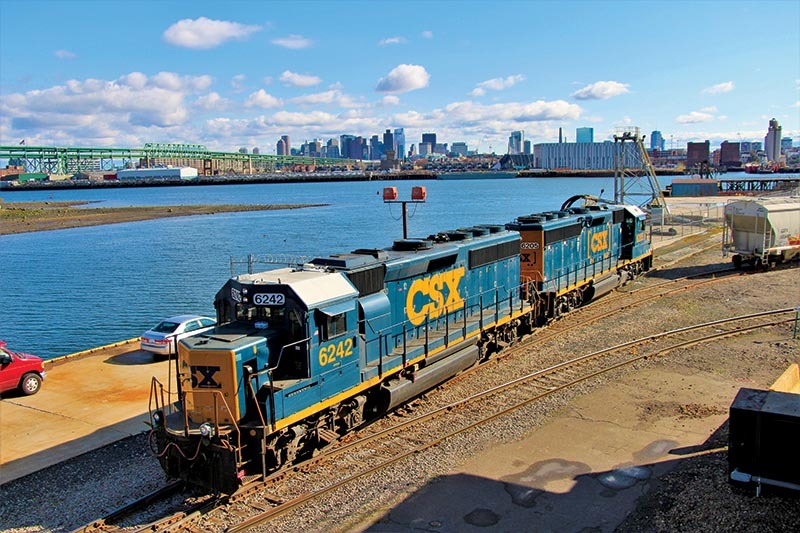 With all these changes, CSX would also be able to retain freight rights into Boston, but service would be dramatically scaled back from what it once was. Train B721 passes the automatic signals at milepost 10 along the Massachusetts Turnpike in Newton on February 11, 2018. 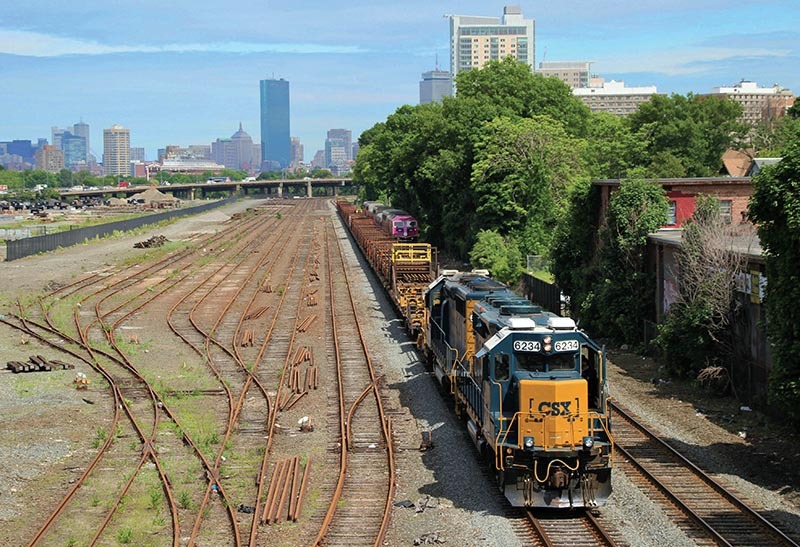 A major part of the deal also included selling off the CSX Beacon Park Yard to Harvard University for redevelopment, with the goal of ending delays for MBTA commuter trains and rerouting the Massachusetts Turnpike through the site. With the closure of Beacon Park Yard, the intermodal service would now go to Worcester, the Transflo facility inside the yard would be relocated to the old Westborough auto facility, and the only freight operation that would remain in Beacon Park Yard would be customer Houghton Chemical Corporation. 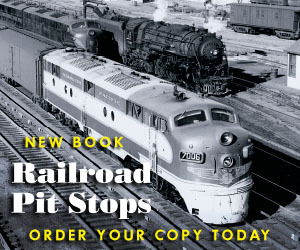 Read the rest of this article in the May 2019 issue of Railfan & Railroad!